If you didn’t tune in to watch this game, you should have. 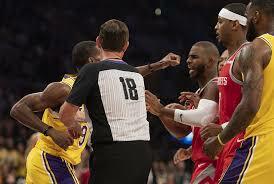 Not only was the Lakers versus Rockets an exciting game that came down to the 4th quarter, it spiraled into a team brawl. Among the players involved, Rockets Point Guard, All-star Chris Paul was suspended 2 games, Lakers Rajon Rondo is out for three games and Brandon Ingram for four games. The fight was clearly started by Ingram after he shoved Rockets James Harden following a foul call. The foul led to Ingram talking down to the ref and eventually leading up to a swarming of players at the foul line. After things seemed to be calming down, the story only gets better. Rondo stepped in and exchanged words with Chris Paul while Ingram was being calmed down. Paul seemed to poke and shove Rondo’s head, causing him to swing first and clock Paul in the head. The two traded punches while trying to be held back by teammates. Ingram, seeing his teammate step up for him, sprints toward the action and lunges. He connects with Paul just before the fight could be broken up. A League investigation, led by NBA vice president of basketball operations Kiki VanDeWeghe, reviewed video and found that the altercation between Paul and Rondo was caused by Rondo spitting on Paul. Ingram will end his suspension on Monday, October 29th, coming back to the court against the Timberwolves. Rondo’s return will be on Saturday, October 27th, against the Spurs. Paul will return to the floor on Friday, October 26, when the Rockets face the Clippers at home.